← Lichen, Digital Publishing, etc. My upcoming collection Botanica has a new member. Brambles is a many-use design. Wear it as a shrug, a wrap, or use as a lap or baby blanket. Rectangles are so useful, aren’t they? The design inspiration comes from the thick brambles that surrounded Sleeping Beauty’s castle. I had a dream several years ago, about a courtyard garden that just needed some bramble clearing and loving care to bloom. New growth often requires clearing out the old to make room for the new. Here I am turning old dead canes into a soft, protective cocoon. I’m using a very simple allover cable, suggesting layers of undulating, wrapping, enveloping vines. The edges are worked in seed stitch. The yarn is the incredible Imperial Stock Ranch Desert Exotic in natural brown. A luxurious blend of 60% Imperial’s own Columbia sheep’s wool and 40% North American alpaca, the yarn is rich, lush, luxurious. Columbia wool comes from Columbia sheep a rare breed specifically developed for the Western Untied States conditions. I love that this yarn combines locally sourced fibers; it speaks of the land, of the terroir, as much as a wine or coffee do. 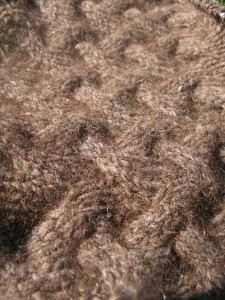 The wool provides a springy, secure base, while the alpaca blooms into a soft, rich halo. The color is darker than the bleached brambles of my dream, but more realistic. And besides, it’s beautiful, goes with everything, and was in my stash. Imperial Stock Ranch is located in eastern Oregon. I have not contacted them, I purchased my yarn at full retail several years ago on a teaching trip. So with that in mind, I love everything I have learned about Imperial Stock Ranch. They produce an incredible product, market and distribute it well, while maintaining sustainable practices. I hope Imperial’s practices can become a model for other small ranchers and producers to follow. I found this video while Googling for more on Imperial. Enjoy!